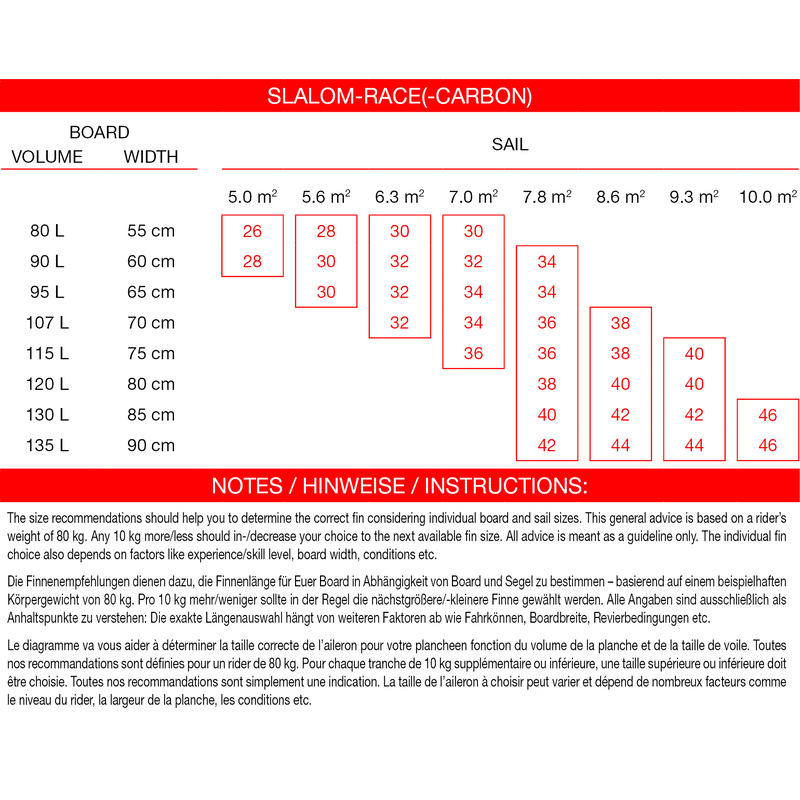 Our Carbon Slalom Race (soft) is the result of 2 years of R&D.It was developed by Rick Hanke and the test team lead by PWA Slalom Pro Kurosh Kiani and 2012 IFCA World Champion Robert Hoffman. Intensive testing took place in europe,UK,France,Denmark and the USA. The Carbon Slalom Race is an absolute high end fin produced at THM Faserverbund Technologie GmbH in Germany. THM is a specialist in composites contruction and has its own test facilities. Using a Tranfer Moulding (RTM) procedure makes sure that the actual fins absolutely match the design concept and are very light , free of air bubble and very stable. All production steps are recorded. The Carbon Slalom Race generates a very high end speed that is achieved from a new thin low drag profile.It is fast on all courses and has excellent upwind ability due to the wide base and accelerates very quickly out of the gybe.
'' The new Slalom Race Carbon is the ultimate powerhouse for the racer or recriational sailor who wants a high end piece of engineering to take His/Her Windsurfing up a level ''. ''Stability and control you can trust and speed you can count on ! ''. Tuttle - Powerbox and Deep Tuttle.